Council head warns Jordan Valley could become terror base, says Israeli residents gearing up for a struggle. Residents of the Jordan Valley will fight the latest attempts to delegitimize their presence in the area, Jordan Valley Council head David Elhayani told Arutz Sheva. United States diplomats have been promoting the idea of an eventual Israeli withdrawal from the region, in the context of a final agreement proposed by the Obama administration. U.S. Secretary of State John Kerry has reportedly suggested that international forces could protect against terrorism in the IDF’s absence. But residents of the Jordan Valley are up in arms at the suggestion, which they say compromises Israel's security. “The communities of the Jordan Valley will not sit silently in the face of the recent reports regarding a change in the Jordan Valley’s status, at least in the Americans’ eyes,” Elhayani said. “We want the position that the Jordan Valley needs to be under Israeli sovereignty to have overwhelming support, so there will be no question mark hanging over the Jordan Valley’s future,” he explained. Replacing Israeli communities with an international force would be a disaster for Israel, he warned. The area would be like southern Lebanon, he said, where Hezbollah seized control and deployed thousands of rockets aimed at Israeli cities, despite the presence of international troops. “You and I can’t send an army to patrol the border with Jordan in a hostile Palestinian environment, where an RPG could be fired at them at any moment,” he stated. Palestinian terrorist groups have already declared that if foreign troops are stationed in the region, they will be attacked. “There will be no security here without Israelis living here,” Elhayani concluded. The Jordan Valley runs through eastern Samaria (Shomron), to the north of what is often referred to as the "West Bank". 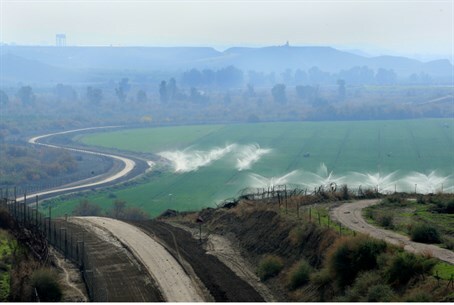 Vis-a-vis negotiations, Israeli leaders have long subscribed to the "Allon Plan", which maintains that in the event of a withdrawal from the rest of Judea and Samaria, the Jordan Valley would need to be kept by Israel for strategic reasons. But the theory that an Israeli withdrawal from Judea and Samaria would still be "safe" for the Jewish state as long as a presence was maintained in the Jordan Valley has been challenged. In particular, Arutz Sheva analyst Mark Langfan has pointed towards formerly classified US military documents which posit that, on the contrary, the Jordan Valley - along with all of central Israel - would be extremely vulnerable to attack in the event of an Israeli withdrawal from the rest of Judea and Samaria. Langfan further warns that any military presence in the Valley - Israeli or otherwise - would not be sustainable if the neighboring highlands of western Samaria were ceded to the Palestinian Authority. In any event, John Kerry's proposed plan is said to preclude even an Israeli presence in the Jordan Valley. Kerry's plan would reportedly only permit Israel to partially retain the 15 kilometer (9 mile) wide strip of the Jordan Valley as a security zone for 10 years.